50 Sheets | Ages 3+ 9" x 6"
We took this pad on a trip with us with crayons and my toddler loved to doodle. This is the perfect size for small hands. This pad is just the right size for my toddlers to doodle on, and it's much nicer than scrap paper that ends up scattered all over the house making a mess! Great size for on the go colouring and drawing! My grandaughter loves this. Bought it to go with the Melissa and Doug stamps. Works great on this pad. Great little pad for my toddler. I thought it was too small but when I gave it to him he loved it. Neat little doodle pad- great size and price! This is a handy tablet of paper for the little ones to use. Price is good, too! 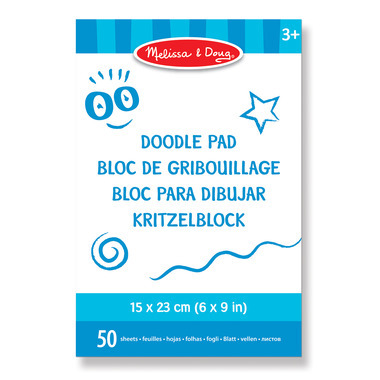 This is a great little doodle pad for kids. My preschooler loves to draw and it's the perfect size for her! The perfect small size for perfect small people! Great for loot bags too! Great sized for a small art project. My kids like to use pastels on it. Love throwing this in the kids bag to take to appts, car rides, etc. Perfect size! The perfect size to carry in my purse with some crayons just in case!! Great sized paper for my little one to bring in her backpack, good price too.